Catholicism has a long history in the U.S., with the Catholic Church the single largest religious denomination in the United States. The Pope is the head of the Catholic Church and faith. Immigrants in the 19th century made Catholicism the largest religion in the United States. Acquisition of territories in the 19th century, formerly possessions of France, Spain, and Mexico, added to the Catholic population in the United States. parish: An administrative part of a diocese that has its own church; found in the Anglican, Eastern Orthodox and Catholic Church and certain civil government entities. The Catholic Church in the United States is part of the worldwide Catholic Church, or the Christian Church that is in full communion with the Pope. It is the largest single religious denomination in the U.S., comprising about 25% of the population. According to a 2011 study by the Center for Applied Research in the Apostolate at Georgetown University, the U.S. Catholic population is currently 77.7 million. The U.S. has the fourth largest Catholic population in the world after Brazil, Mexico and the Philippines. Catholicism arrived in what is now the U.S. during the earliest days of the European colonization of the Americas. The first Catholic missionaries were Spanish, having come with Christopher Columbus to the New World on his second voyage in 1493. They established missions in what are now Florida, Georgia, Texas, New Mexico, California, and the Commonwealth of Puerto Rico. French colonization came in the early 18th century, with the French establishing missions in the Louisiana Territory districts – St. Louis, New Orleans, Biloxi, Mobile, Alabama, Natchez, Yazoo, Natchitoches, Arkansas, Illinois, and Michigan. Catholicism has grown during the country’s history. It started slowly in the early 19th century through immigration and acquisition of territories with predominately Catholic populations. In the mid-19thcentury, a rapid influx of Irish and German immigrants made Catholicism the largest religion in the U.S. This increase of Catholics was met by widespread prejudice and hostility, often resulting in riots and the burning of churches. The nativist Know Nothing party was first founded in the early 19th century in an attempt to restrict Catholic immigration. This party believed that the U.S. was a Protestant nation and the influx of Catholics threatened its purity and mission.. Since the 1960s, the percentage of Americans who are Catholic has stayed roughly the same, at around 25%, due in large part to increases in the Latino population over the same period. 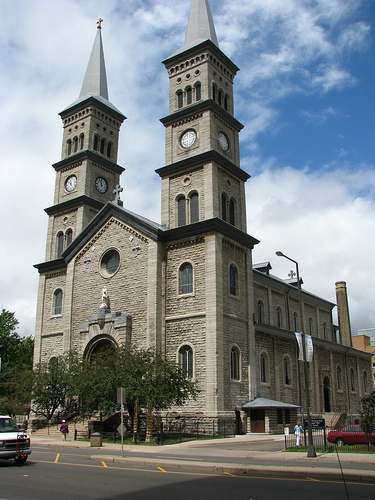 Assumption Catholic Church: The oldest Catholic Church in St. Paul. By far, most Catholics in the U.S. belong to the Latin Church and the Latin Rite of the Catholic Church. Rite generally refers to the form of worship “liturgical rite” in a church, community owing to cultural and historical differences as well as differences in practice. However, the Vatican II document Orientalium Ecclesiarum “Of the Eastern Churches” acknowledges that these Eastern Catholic communities are “true Churches” and not just rites within the Catholic Church. There are 14 other Churches in the U.S. (23 within the global Catholic Church) that are in communion with Rome and fully recognized in the eyes of the Catholic Church. They have their own bishops and eparchies. The largest of these communities in the U.S. is the Chaldean Catholic Church. Most of these Churches are of Eastern European and Middle Eastern origin. Eastern Catholic Churches are distinguished from Eastern Orthodox, identifiable by their usage of the term Catholic. By 1850, Catholics had become the country’s largest single denomination. Between 1860 and 1890, their population in the U.S. tripled through immigration; by the end of the decade it would reach seven million. This influx would eventually bring increased political power for the Catholic Church and a greater cultural presence. This led to a growing fear of the Catholic “menace” among America’s Protestants. Some anti-Catholic political movements like the Know Nothings, as well as organizations like the Orange Institution, American Protective Association, and the Ku Klux Klan, were active in the U.S. during this period. Indeed, for most of the country’s history, Catholics have been victims of discrimination and persecution. It was not until the presidency of John F. Kennedy that Catholics lived largely free of suspicion. There are 68,503,456 registered Catholics in the U.S. (22% of the US population), according to the American Bishops’ count in their Official Catholic Directory 2010. This count primarily rests on the parish assessment tax that pastors evaluate yearly according to the number of registered members and contributors. Estimates of the overall American Catholic population from recent years generally range from 20% to 28%.